HomeSchool Minder comes with over 16 prepackaged reports plus additional generated reports depending on the settings you define in the system. Navigate to this module by selecting the last tab in the main menu. 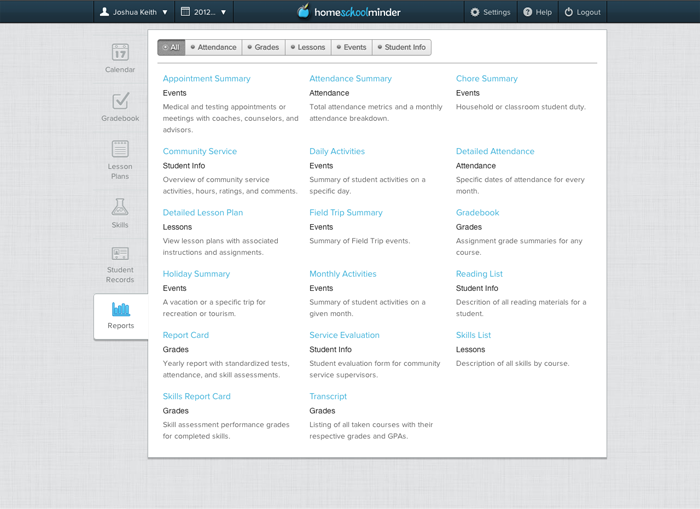 This is where you will find every report segmented by category: Attendance, Grades, Lessons, Events, and Student Info. All reports may be filtered, allowing you to view information however you like. Finally, you may download reports for printing or emailing. Attendance Summary - view a student''s attendance by month. Detailed Attendance - view a student''s daily attendance. Gradebook - view all assignments in a course within a date range or set of terms. Report Card - a complete overview of a student''s perforamance for one or more terms in a year. Standardized Tests may be optionally shown and attendance information will be displayed if you are tracking it. Skills Report Card - view skill evaluation grades for one or more terms in a year. Transcript - listing of all courses, grades, and GPAs for a student grouped by year or class. Standardized Tests may be optionally shown. Detailed Lesson Plan - view of a course''s lesson plans in a specified date range with any associated instructions and assignments. Skills List - a listing of all skills and related details for a selected course. Event reports are largely based on your activities in the Calendar. These reports will default to the currently selected year''s dates and show the active student''s information. HomeSchool Minder comes with summary reports for Field Trips as well as any other Custom Event you''ve defined in the system. These include the Appointment Summary and Chore Summary by default. You also have access to overview reports for daily or monthly events which are especially useful for printing off a checklist for the day or week. Community Service - an overview of a student''s community service activities. Service Evaluation - a sample form allowing community service supervisors to provide feedback on volunteer work. Reading List - view a checklist of all reading materials for a student. Every report comes with filters which allow you to disect information in numerous ways. Generally speaking, a report will always default to the currently selected student and the current year''s date range and terms. Some reports, such as the Gradebook report, will default to a course, so please check the filters if you were looking for a different course and didn''t see the assignments you expected. To activate the report filters, select the Filter button in the top right corner of the reports area to see the filters available for the current report. Whenever you make a change to one of these filters, the report will update itself in real-time, so there''s no need to submit changes. Reports may be printed by selecting the Download button in the top right corner of the reports area. This will create a PDF version of your report along with a header for the selected student containing their name as well as your teacher information. You may then print this PDF directly or save the file to email to other parents, teachers, or schools.